On the face of it, this might seem like an odd one. What has IBS got to do with a cold or the flu? Well quite a lot actually. Just having to deal with another illness on top on IBS is difficult enough sometimes, but when a virus starts effecting your IBS, things get even trickier. Here are a few things I've learnt over the years that might make dealing with a common cold and IBS at the same time a little bit easier. Often with a virus, the last thing you feel like doing is eating but with IBS, skipping meals can cause a flare up of symptoms. It's important to at least eat light meals regularly, especially if you're taking pain killers as they can also irritate your stomach. I know when your feeling ill, any slight relief is a blessing but I personally find that if I'm taking pain killers regularly then they make my stomach cramps flare up so after the first few days of being ill I try and reduce how many tablets I'm taking. If you're on any prescribed medication for your IBS like I am then it's super important to carry on taking it as you'll only make yourself feel worse. Again I know it's probably the last thing you want to do and sometimes you may forget but try setting an alarm and make yourself take your medication. It's for the best. We all know rest is the best thing for you when you've got a virus but when you're dealing with two illnesses you're going to feel even more burnt out. Take some time to properly rest, your body will thank you for it. There is no miracle solution for feeling better but hopefully these tips will help a little. 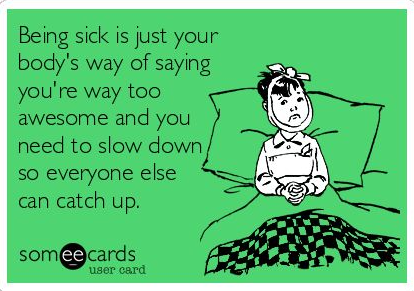 If you don't personally suffer with a chronic illness but know someone who does then please try and remember that simple illnesses are often much harder for people with a chronic illness to deal with so please be patient and kind, it'll help them a lot. You can check out my previous IBS posts here.